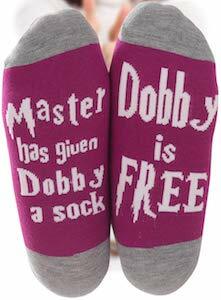 If you are a Harry Potter fan in need of fun socks then you should get these Dobby Is Free Socks. These women’s socks are size 5 – 8 and they come in two colors. The Harry Potter socks are just plain socks and nobody will know that they are socks from a Harry Potter fan until the look at the bottom of your feet as there you can find the text “Master has given Dobby a sock” on one foot and “Dobby is Free” on the other sock. We all know that Dobby got free after harry got him the sock and these socks are all about that in a fun way. 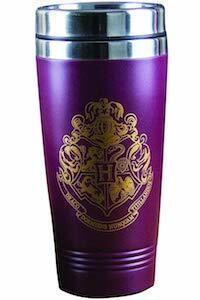 Harry Potter fan can now always have coffee with them all thanks to this purple Hogwarts Crest Travel Mug. The Harry Potter travel mug is purple in color and on the purple you can find a big Hogwarts crest on it in gold which really looks pretty neat on the purple. Inside there is room for 17oz of your favorite beverage and it does not matter it is butterbeer or coffee or maybe a hot tea. No more paper cups for your and the environment is happy for that because you can take this mug to your coffee shop and let them put your drink inside it. 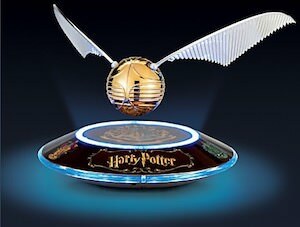 Harry Potter can now have a real Levitating Golden Snitch. You don’t have to play quidditch to be able to catch the golden snitch because this time you can own a golden snitch that just floats above a nice Harry Potter themed base that has the Harry Potter logo and also the logo’s of Hogwarts and the houses. And to make this look even more amazing you can even turn the light in the base on so that it really looks stunning in the dark when the golden snitch just hangs there like it flying. This is an unique item that is something a true Harry Potter collector wants. The school of Hogwarts is the Magical World of Witchcraft and Wizardry, so many teachers and students have their own wands and unique spells to perform. Now you can have your very own Harry Potter build and code a wand. 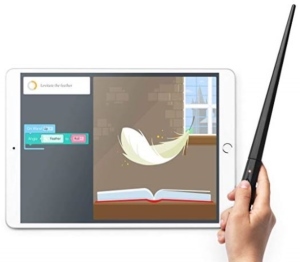 This is a perfect idea for and Harry Potter fan, you get to build your own wand from parts then learn how to code over 70 creative challenges. Once they are coded and you have them mastered you can wave your wand at the screen and see the instant effect like making feathers fly, goblets multiply, fire flow and make pumpkins grow. This Harry Potter wand coding kit includes: wand parts to build a wand of a PCB with codeable LED, button, batteries. Also included is a step-by-step book for all your magical spells, stickers, poster, and a free Kano app. Now there is a fun women’s Hogwarts Is My Home Pajama Set. All the Harry Potter fans in need of a fun pajama can now have this one that is just made for the true fans. The pajama set comes in women’s junior sizes XSmall – 3XL and 60% cotton and 40% polyester. The pajama is red in color with black 3/4 sleeves and on the red pajama top you can see the text “Hogwarts Is My Home” and then both the pants and shirts have many Harry Potter details including the Hogwarts castle and much more. A fun pajama like this is great for yourself but also makes for a fun present for a Harry Potter fan. Now Harry Potter fans can eat in style all thanks to this Gryffindor Dinnerware Set. The ceramic dinner ware come in a set of a mug, plate, and bowl. 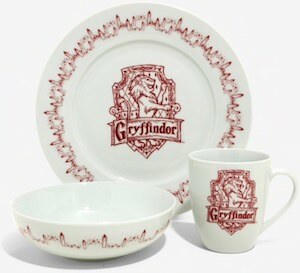 The dishes are white and have a red print on it with the famous Gryffindor logo. So if you feel part of Gryffindor just like Harry Potter then eating from matching dinnerware is what you need. It does not matter if it is just you or if you like to dine with friends as you can get as many sets as you need. And like magic you can wash these Harry Potter dishes in the dishwasher and you can reheat your food on them in the microwave. Now Harry Potter fans can shower in style all thanks to this Hogwarts shower curtain. 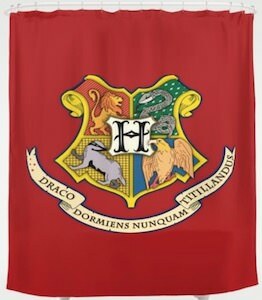 The Harry Potter shower curtain is red and on top of the bright color you can find the crest of Hogwarts with the famous banner below it. The Hogwarts logo shower curtain is 71 x 74 inches and is made in the USA from 100% polyester with 12 eyelets for your shower curtain hooks. And when you thinks your shower curtain gets dirty then you can machine wash it so that the Harry Potter vibe can be with your for a long time so that we never forget about the school that taught Harry about magic. A great movie combined with a great building material can only mean a great product, add Harry Potter, The Great Hall and LEGO to achieve this greatness. The Hogwarts Great Hall Building is the center piece for this LEGO set, find the fine Hall details of a tower with movable spiral staircase, treasure room, potions room and house banners. Also included is 10 LEGO minifigures: Harry Potter, Ron Weasley, Hermione Granger, Draco Malfoy, Susan Bones, Professor McGonagall, Professor Quirrell with dual Lord Voldemort face, Hagrid, Albus Dumbledore and Nearly Headless Nick. 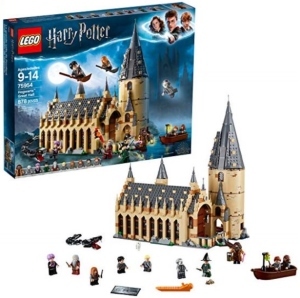 The Harry Potter Great Hall Building has a total of 878 pieces and is labeled as LEGO 75954, it is perfect for the Harry Potter fan and can be added to all of your other awesome Harry Potter LEGO sets. Now there is a fun Christmas tree ornament and it is a Harry Potter and Snape Christmas ornament. 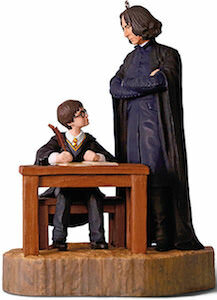 The Christmas ornament shows Harry Potter in class at Hogwarts while he is being stared at by Professor Snape. The ornament looks amazing and it is made by Halloween in their keepsake series. And ornament like this will look amazing in any Christmas tree of a true Harry Potter fan. 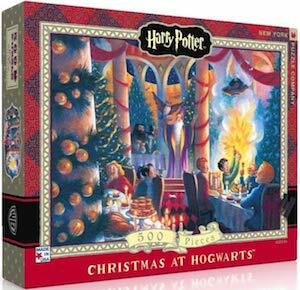 As this ornament is not really decorated for the holidays you can even keep the ornament out and have it decorate your house and be part of your Harry Potter collection.